These days it seems like more and more people are being diagnosed with skin cancer. The American Cancer Society reports that in 2014 there was an estimated 76,100 new cases of melanoma were diagnosed and approximately 9,710 died from melanoma. And, while many skin cancers are highly treatable, they are still cancer. For this reason, it is important to take every precaution to avoid skin cancer. And often, many of the skin cancer prevention methods will also protect your skin from damage and premature aging so they are generally good measures for everyone. Avoid Direct Sunlight – UV rays tend to be at their most harsh between 10am and 4pm so avoid these “peak hours” so protect your skin. Just because those are the peak hours doesn’t mean you can’t be outside at all during the day. Try to avoid direct sun exposure during those hours and if you plan to be outside, try to stay in the shade so that the harmful rays aren’t directly hitting your skin. 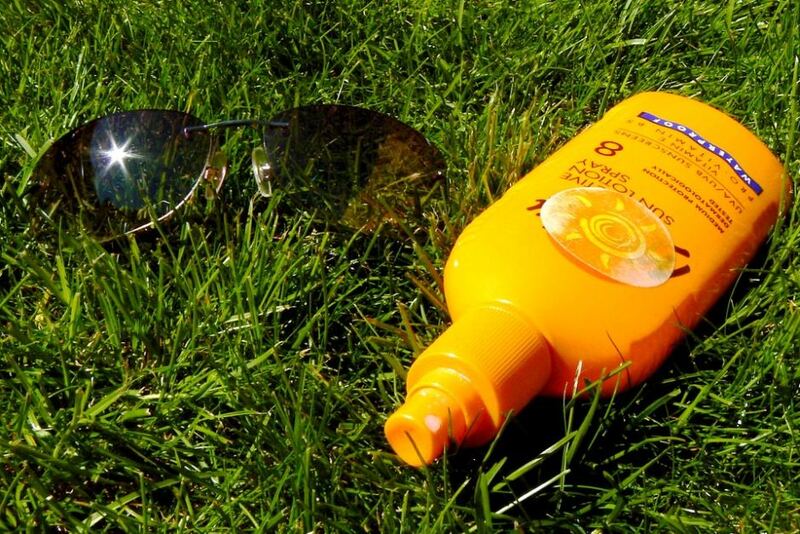 Sunscreen – Sunscreen is not just for when you plan on going to the pool or to the beach. Sunscreen should be worn every day, all year. Choose a broad spectrum sunscreen with an SPF of 15 or more to help filter out the harmful rays and protect your skin. It is important to reapply your sunscreen after swimming in water or every two hours to ensure maximum protection. Wear Protective Clothing – Whenever out in the sun wear a hat to protect your head and face from harmful and damaging rays. In addition to a wide-brimmed hat for protection, wear protective clothing on the rest of your body as well. The CDC discusses what clothing is best for optimal protection, ” When possible, long-sleeved shirts and long pants and skirts can provide protection from UV rays. Clothes made from tightly woven fabric offer the best protection. A wet T-shirt offers much less UV protection than a dry one, and darker colors may offer more protection than lighter colors. Some clothing certified under international standards comes with information on its ultraviolet protection factor. If wearing this type of clothing isn’t practical, at least try to wear a T-shirt or a beach cover-up. Keep in mind that a typical T-shirt has an SPF rating lower than 15, so use other types of protection as well.” Also, don’t forget to wear sunglasses because even your eyes can be affected by skin cancer. No Tanning Beds – While you may want to give your skin a summery glow all year long, the tanning bed is not the way to achieve the look. Consider using a spray tan or other temporary bronzer to get that sun-kissed look. Tanning beds are incredibly damaging for skin which will not only age your skin but significantly increase your risk of getting skin cancer. Check Your Skin – If you notice an irregular mole or other irregular skin it is important to have it checked out by a dermatologist right away. It is also a good idea to see a dermatologist annually for a regular examination to make sure everything looks as it should.